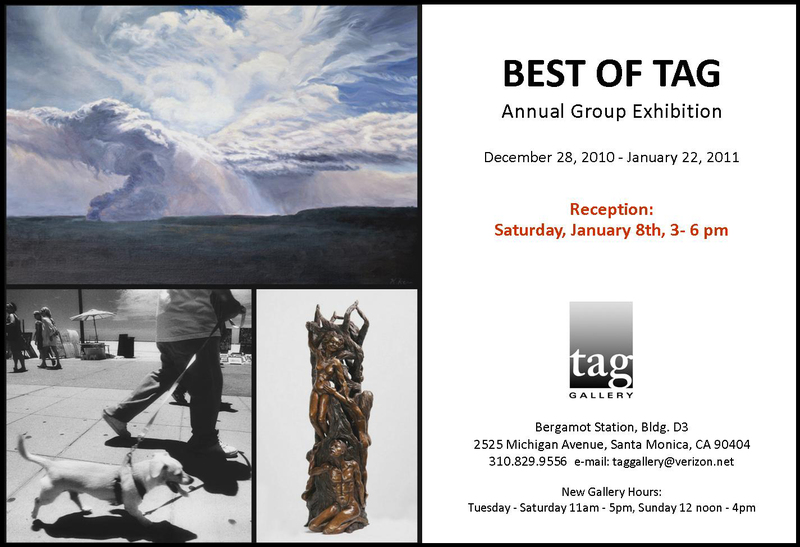 I have one painting in this exhibition that starts December 28 and runs through January 22. 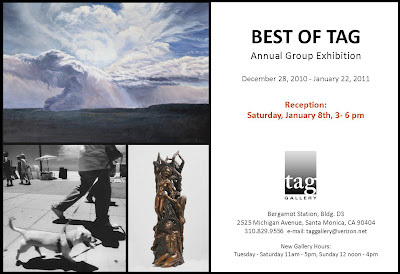 The reception will be Saturday afternoon, January 8 from 3 - 6 pm. This should be early enough in the day to avoid the traffic jams that can occur on Michigan and in the parking lot from so many galleries holding simultaneous openings. The gallery will stay open until 8pm on that evening and will be open from noon to 4pm on Sundays, as well as during the regular Tuesday through Saturday hours of 11am - 5pm. I'm emerging from an epic cold that's been with me for a little over two weeks. It couldn't have come at a better time as I've been looking forward to a little "down" time and I was relatively free of obligations. Still, it's nice to be able to breathe without coughing and I never did master the new, cough into your elbow protocol. I understand the principle, but I think my arm is too long, so I end up coughing at my elbow, allowing the germs to escape all over, which is what we are trying to avoid, right? Outside the rain is relentless - up to an inch an hour, hour after hour, causing problems for all sorts of people and flooding my mailbox. This means that the holiday cards that were waiting to be picked up were soaked and had to be thrown out and redone. Now my mail waits inside a plastic envelope within a tarped mailbox. So, with all of this going on, why am I celebrating? ﻿Today is the shortest day of the year. After today the hours of sunlight grow longer, and the light grows stronger, and there will be more natural light to paint by and this thought makes me very happy. This is not to say that I've been minding the shortened days that much. It's been a good time to dream, and to count my blessings. I've enjoyed home improvements, new kittens, painting breakthroughs, sales and new collectors, travel and connections, and friends; both vintage and new. It has been a good year. Separation Anxiety work in progress graphite 4 x 12"
Between Holiday shopping, card writing, parties, and some artwork shipping (more on that later), I found some time to squeeze in this drawing. I've been captivated with the patterns that birds make in the air when they are flocking and roosting, and even more so with the bare branches starting to appear. This piece is not quite finished, but the changes are so slight you probably wouldn't be able to notice from a the low resolution photograph that you are seeing online. It is composed on three pieces of paper with torn edges and I plan to frame them together in one frame, floating (no mat), with a tiny separation between the three - hence the title. I actually enjoy tearing paper and I usually prefer the way it looks over cut paper. On another note, would you believe that I just now found the spell checker on blogger? Now I have no excuses left for my typos! An impromptu celebration of sparkling wine, cheese, crackers, veggies and hummus at the final hour, was followed by a quick and efficient de-installation that almost beat the coming rain. Paintings unloaded (in the wind and rain), cargo van refueled and returned to U-Haul, check! The opportunity to exhibit in a large space is sometimes the only time to get to see an entire body of work together at once. I didn't have much time to paint while the exhibition was up, but I’ve enjoyed the time to get to see the work and start to reflect on the direction it’ll be taking next. I left over two feet of wall space between paintings, which seemed like ample room on paper and although I was satisfied with how it all looked once hung, after leaving for a day or two and them returning with a fresh eye, the space felt crowded to me. Perhaps that’s because I’ve been used to seeing everything in the studio, where space barely allows for seeing everything together. In the future I’d like to leave more room - enough so that when stepping back away from the larger paintings, the ones around it do not intrude on peripheral vision. I know of no rule of thumb for determining the amount of space needed, but it seems like 36” between the larger works, or even more, wouldn’t be too much. I underestimated how many business cards, various print outs and price lists I needed. I had to keep replenishing them with what I thought would be ample quantities, and even so, I ran out of a couple of items on the last day. I am not complaining – and I am happy to be able add to my address book from those that left their information when coming to see the show. I've always liked Fine Art Cards and enjoy collecting them at museum gift shops and galleries and more recently online. 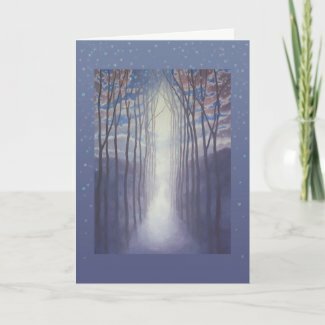 I don't create cards from every painting that I do, but I have a few card designs available. The cards below are digital variations of original paintings. In this case, snowflake effects have been digitally added for a seasonal look. These cards are printed by Zazzle. I like Zazzle for their very high quality and lightning fast service, and the added ability to personalize products to suit your needs, at no extra cost. 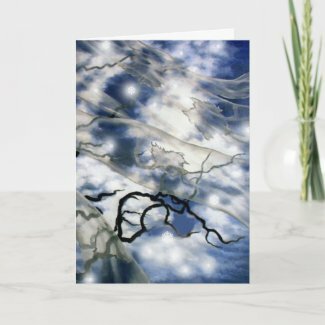 The three cards below include a text greeting printed inside, which can be easily added to or altered with Zazzle's customization feature. I've watched this company grow and evolve in the print on demand marketplace, from a company that printed only cards and posters to one that prints stickers, buttons, shirts, postage stamps, binders and mousepads - just to mention a few. 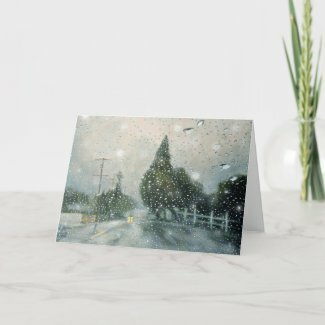 As an artist my experience with Zazzle has been encouraging. There is no fee or cost to the artist to upload an image and create a product. The print on demand service eliminates the need to invest in and maintain an inventory and Zazzle allows the artist to name their royalty percentage. 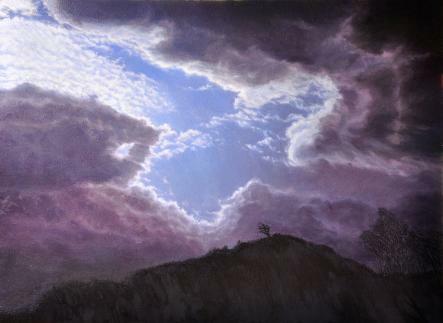 If you're an artist you might like to look into Zazzle's services. I'd be happy to answer any questions that I can based on my own experiences. 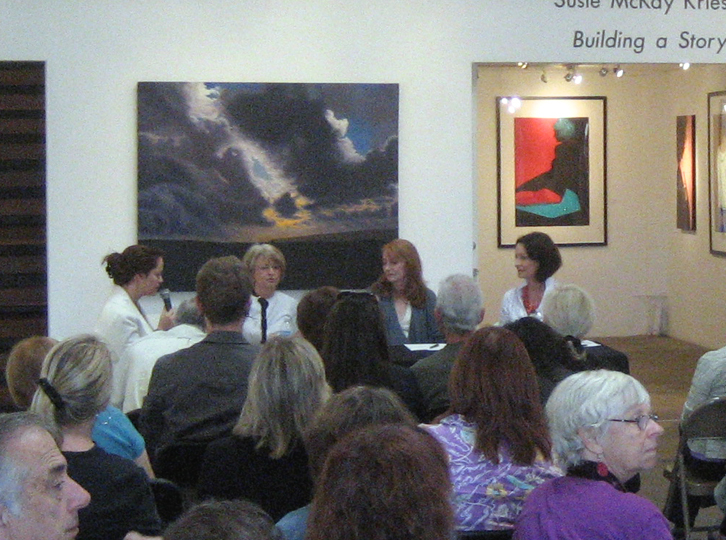 The Question and Answer Panel at TAG Gallery on Saturday was well attended. Microphones helped everyone to hear and TAG’s Director, Amy Lombardo, kept the discussion going. As the moderator, she could insure that nobody rambled on for too long, and for those of us who tend toward the laconic, she prompted more with further questions. There were also wonderful questions from the audience. A couple of questions were difficult to answer - as sometimes the best questions are. One was about the moods I am painting and whether they were of sadness, joy, excitement, or something else. I answered that they are multi layered and I had to say that if I could adequately convey all the nuances in words that the need to paint them wouldn't be as compelling. 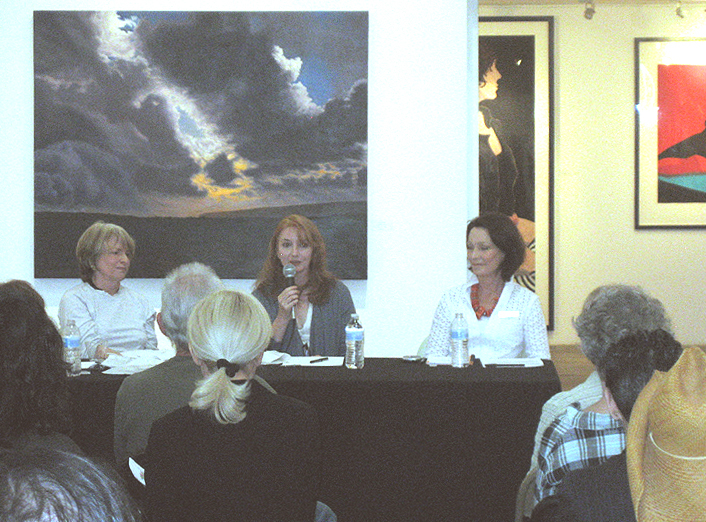 Amy Lombardo addressing questions to the panel. The questions about our three exhibitions alternated among the three of us as we passed the microphone back and forth. We were each asked about the advantages and disadvantages of our chosen medium, the answer for me is that I like the color, control and archival qualities of oil on linen and the biggest challenge is the drying time. Sally Jacobs (From the Ground Up) commented on the advantages and difficulties of working with botanicals - such as the fact that they age and decay, and Susie McKay Krieser (Building a Story) talked about the challenges of figurative subjects – of how she handles issues of positioning and the scale. Susie McKay Krieser explaining working with models. It was great to have such an attentive and intelligent audience and I really enjoyed myself. I am grateful to TAG’s gallery assistant Craig Best, who had the presence of mind to ask for my camera and take photos, which is why I am able to post a few of them here. oil on linen 20 x 10"
Have you ever wondered why an artist might choose to work in the medium that they do, or what experiences in their lives might have been a turning point in their careers? This weekend you'll have the opportunity to find out the answers to these and other questions at our moderated Question and Answer Panel on Saturday, November 13th at 3pm at TAG Gallery in Santa Monica. I will be prsent, along with Susie McKay Krieser and Sally Jacobs. Gallery Hours: Tuesday -Saturday 11am - 5pm and Sunday from noon - 4pm. I took one photo before the reception started and then put the camera away and forgot all about it while spending the next three hours with guests. Thanks to everyone who came - there was a wonderful turn out! It was wonderful to see so many friends. I, of course, loved the feedback and I also got to introduce friends to other friends, which is one of my favorite things to do. For those who couldn't make it - don't despair - Saturday we're having a moderated Question and Answer Panel with Susie McKay Krieser, Sally Jacobs, and myself at 3pm. We're also staying open until 7pm on Friday evenings and are open on Sundays from noon until 4pm. After all the running around I've been doing; delivering artwork, buying sparkling water and ice, buying more ice, getting my car towed to the shop (again! ), this week I'm attempting to get back into a more normal routine. Today I spent some time in the studio cleaning one painting, and wiring and finishing the edges of another, getting it ready to ship. If all goes well, by next week I'll get back to doing some actual painting. I got all the paintings delivered to the gallery and installed last weekend, and took a couple of photos of the process along the way. I rented a cargo van from U Haul to accomodate the larger paintings. It was a very new van and handled better than any that I've used before, which was great. That used to be my least favorite part of having an exhibition. Here is the mostly empty gallery, freshly patched and painted. The paintings are carried inside and lined up where I think that they'll go. After some suggestions from Ellen Starr, who has an amzing eye for how to hang an exhibit, the paintings are up on the wall and waiting for lettering. Not every painting got hung, and those that didn't fit are up in the stacks so that they are still available for viewing. The lettering being installed for Sally Jacob's exhibition From the Ground Up. Everything up on the walls, lighting adjusted, and ready for our first visitors. The exhibition runs through November 27th and the gallery hours are Tuesday through Saturday from 11am - 5pm. The reception is Saturday, November 6th from 5 -8pm and the Question and Answer panel is Saturday, November 13th at 3pm. We'll also be open on Sundays from noon until 4pm along with several other galleries at Berganot Station. I’ve been noticing these growing in my garden this past season. When I first saw them, it was at the peak of summer when the Foxgloves were blooming and occasionally dropping their petals. These are about the same size and of a similar color. However, when I went to pick one up I realized that it was attached to the ground – and that it was actually something growing. It turns out to be something fairly common, called a stinkhorn. It's a fungus that grows out of an egg that is buried just underground. As if that isn't strange enough, it seems that certain varieties cause a tremendous stench when they let loose their spores, hence the name. Luckily these seem to be an odorless variety. Bear and both cats were out with me while I was taking the above photo. I was focused on getting a clear image when Bear commenced alarm barking and rushed towards the fence. I looked up to see what the danger was and saw a coyote loping up the hill, and then another. It’s unusual to see them out during the day; especially so late- it was about 3pm. I looked around quickly to locate the cats. Tasha was right by my feet calmly chewing on grass, but Zabrina, who had been nearby a moment before was nowhere to be seen. I started up the steps toward the gate. I wanted to check for sure that she hadn’t gone over the fence toward the ravine when up she popped onto the top and stood on the edge of the fence with big, big eyes and a very bushy tail. She didn’t want to jump down and just remained nervously balanced on the edge. I realized that the coyotes might be just on the other side. I opened the gate and ran out, scaring them away and managed to get this shot in just as they disappeared over the edge of the ravine. Thanks goodness for Bear’s alertness. I hope Zabrina’s learned some wisdom from the close call. 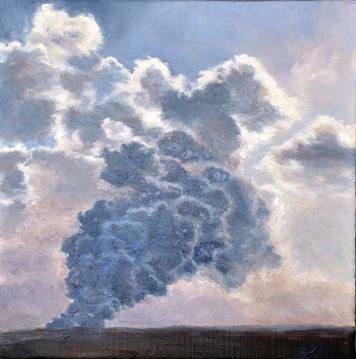 Vent © 2010 Katherine Kean oil on linen 10 x 10"
TAG Gallery has a blog and has been running a series of interviews with exhibiting artists all year and this week it's my turn. I have been the interviewer many times in my life and I must admit it was a kick to answer someone else's questions! If you've got the time, take a look at my interview on the TAG Gallery blog. Feel free to leave comments or ask more questions. I promise I'll be checking in often to respond. Even though around here it seems the hottest weather has waited for September and October and that could make it seem like this is still summer, it is indeed the Fall season. How do I know? When I look at the ground it is covered with bits that have fallen off of trees; little pods, nuts, leaves, green olives, small twigs, larger branches. While I was out trimming the dried Sunflowers, all around me things were dropping. A plop here, a plunk there, as walnuts fell off the trees, one every few seconds. Loud crinkly flutters as plate sized Sycamore leaves drifted down to the ground. The squirrels were in a nut gathering daze, not caring that I, the two kittens, and the dog were a mere yard or two away. I haven't been painting a lot this past week, since I've been attending to the details of prepping for the exhibit. I've just updated my website, adding new images and reorganizing a bit. I think I've simplified it and hopefully it will be easier to navigate - let me know what you think. Also, I just sent out an email blast this week about the Atmospheric Exhibition with all the key dates. If you did not receive one and would like to be notified of upcoming news and events, click here to join my mail list. 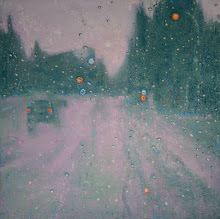 oil on linen 30 x 40"
Click here to preview selections from the exhibition. Sally Jacobs From the Ground Up and Susie McKay Krieser Building a Story. Last week Zabrina and Tashi turned one year old. Zabrina celebrated by catching her first bird. On this particular day I left the studio door open just enough so that the kittens could come and go. I was upstairs when I heard Zabrina's high pitched, little, squeaky meow. Wondering why she was in and crying I hurried down to the studio to find her standing over a lttle bird lying on it's back, feet up in the air, eyes closed. I assumed at first that it must be dead, but as I got closer I saw that it was still breathing. Gentle Zabrina, the likely suspect, seems to be lacking the killer instinct, and so far hunts just to play. I scooped Zabrina up and put her outside and closed the door. She squeaked in protest as I left her out while I went back to tend to the bird. The little bird, mostly black with a black beak, except for a white belly and a bit of white trim on the wings, was still lying supine. It looked whole and unharmed, nothing broken, no bleeding, all feathers intact and unruffled. The heavy breathing continued and I could see the beak also gently opening and closing, but the eyes were till shut. I watched the bird breathe for awhile as I figured out what to do. I went and found a box. I didn't know yet if I would just be sheltering the bird for awhile or taking it to the vet, but I knew a box was the first step. I put on disposable gloves and was about to gently scoop up the bird. I hadn't yet touched it, but just came near with my hands when it suddenly jumped up, landing in one fluid motion in a standing position with wings partially outspread, eyes open, looking ready to fend me off. Both surprised, we stared at each other for a moment, then I placed the open end of the box over the bird. My plan was to slide a piece of cardboard under the box and carry the box with bird to a safe location. I inched the cardboard under, opened the top of the box to check on the bird, inched the cardboard some more, peeked at the bird, and on the third time that I opened the top flaps of the box the bird flew out and swept around the room coming to perch on top of the molding of the studio closet door. At this point there was a choice for the bird. It could fly up the stairs and into the main part of the house where it might be difficult to get back out again, or it could go the other way and fly out the studio door. I quietly slid the studio door open and stood back out of the way. The bird flew into the air and made one circle of the studio and then found the door to the outside, chirping once at me on the way out. I felt elated with the happy ending. I allowed the kittens back in, picked up the box that I never really needed, and got back to my day. Later I found that the little bird had left a little something behind. One lucky painting had been blessed with bird poo, probably during that circular flight around the room. I scrubbed at it with water, then Gamsol, and finally sandpaper and eventually got it all off. This week I will be retouching that spot. Small price to pay. I just sent out my Autumn Newletter. In it I wrote that it doesn't feel like Autumn to me, but like summer has finally arrived - it has been so cool and misty all summer up until the past few days. But I spoke too soon! I woke up to more cool, hazy, looks like it might drizzle any second weather. I'm enjoying it either way. Sign up to receive my Email Newsletter or click here to view my current newsletter online. It's hard to believe that around this time a year ago we were still waiting for the Station Fire to be put out. Most of the Angeles Forest has been closed since then, to give the forest and the wildlife a chance to recover. The original plan was to reopen September 30th, but I've been hearing that it might take a little longer, or that some parts may reopen and other parts will reopen later. Here is a video from one camera outfitted with motion sensors placed to record wildlife. The camera survived the fire because it was in a stream and sheltered by a boulder. Something to watch out for when the forest is reopened is the poisonous Poodle Dog Bush. Cute name, pretty flower, but if you touch it you may get poison oak type symptoms: blistering, itching, and swelling. This plant prefers not to compete with other plants, so it takes advantage of all the space after a burn. 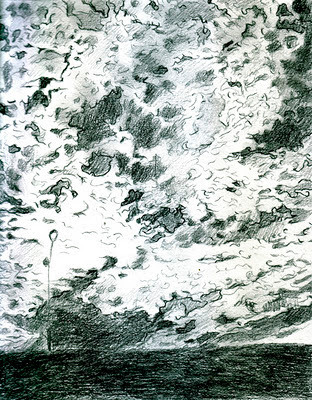 Here is a sketch that has hopes of becoming a painting. I have my doubts about the street light on the left in the bottom of the sketch. I may leave it out - or at least not paint it in until the rest of the painting is finished. Or, it may become a tree, if I can find just the right tree to go in it's place. Or, perhaps the painting will stand on it's own without a streetlight or a tree to provide context. I got a chance to pick up the postcard announcements for the Atmospheric exhibition from the printer yesterday. They are 5 x 7" and feature Converging Conditions of the front with my name, and all of the exhibit info on the back. If you would like one, email me your street address and I'll send it out to you. And some fun news - I heard from ArtSlant that Counting Raindrops has been selected as a Showcase Winner in the 5th showcase contest for 2010. I recently received a copy of Accelerating on the Curves: The Artist’s Roadmap to Success. 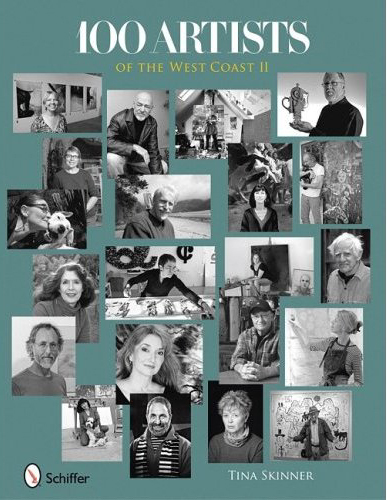 This newly published book from Katharine T. Carter and Associates is a guide to career development for fine artists. I find it helpful that it divides a career into three segments: local, regional, and national, with clearly delineated directions and matkers for knowing where one is and what to strive for next in the general scheme of things. How clear is it? In addition to directions, included are sample cover letters to galleries, just in case you've ever wondered what to say or how to introduce yourself, samples of Press Kits, samples of resumes laying out the correct chronological order, and so on. There are essays from seventeen art world professionals and a section devoted to resources for artists. With 363 pages I've just begun to get into this book - jumping into the sections I need right away. Not cheap, but full of value, I believe that it is only available through this link at the current time. I’m just back from a trip back east, visiting Cape Cod and Maine. The trip to Maine was quick, picking out highlights from this wonderful location, while barely scratching the surface of all there is to see. The weather was sunny and bright on arrival, then partly cloudy turning to rain the second day, finally stormy and pouring, giving way to clearing by the third day before departure. I love rain and clouds and I was mesmerized by the waves, as well as the beautiful contrast of color and shape between the stratified red rocks and blue green water. Below is a colorfully clad group waiting to witness the Thunder Hole spectacle, when waves during high tide slam into an under water cavern causing a sound like thunder as the water collides with trapped air. Stairs lead all the way down to rocks near the very bottom, but the lowest area was closed off. The reason for this may be due to the tragedy that occurred last year when storm surging waves swept several visitors into the water. Meanwhile back in Cape Cod the drizzly skies of a few days prior had cleared enough to make a canal tour worthwhile. Below are a couple of images: an abandoned island - I believe it is for sale. It is accessible by boat and you'd have to arrange to have drinking water delivered. Next followed a drive to the Cape Cod National Seashore to see beaches, marshes, and dunes and on the way back a visit to one of my favorite marshes while the tide was high, the weather clear, and at my favorite time of day, when the angle of the sun creates sparkle and depth. 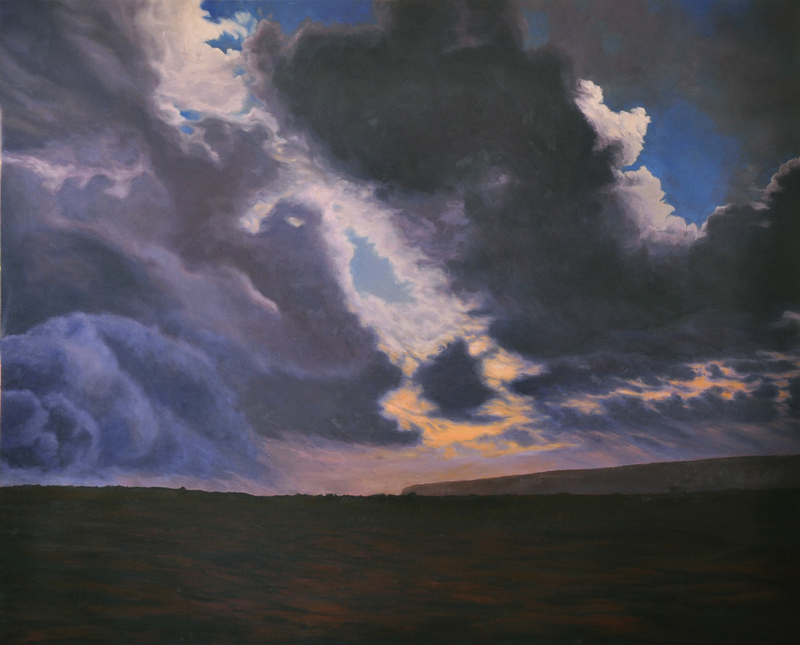 Converging Conditions oil on linen 48 x 60"
I am enchanted by the curl of a cloud as it unfolds across the sky, how the wind’s energy traces the edge of a storm. In turbulence or tranquility, my work explores the natural forces that surround us and shape our lives as they call to mind the fluctuations of our experience within life’s larger patterns. By combining memory and observation, I reach for an essential mood as nature’s ever-changing forms are edited and rearranged. Paint, applied in layers of decreasing opacity followed by glazes made translucent with wax, allow for unexpected variations in color and tone. The viewer is thus invited to share experiences that engage the eye and evoke a state of mind. 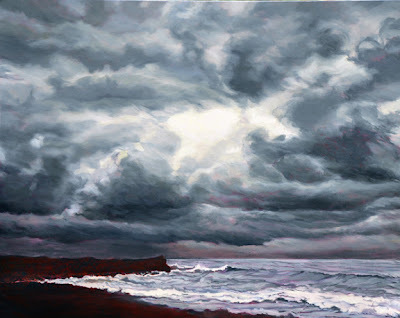 Rapidly Changing Conditions oil on linen 20 x 30"
Although I am technically finished painting for my show, new images continue to come to mind. 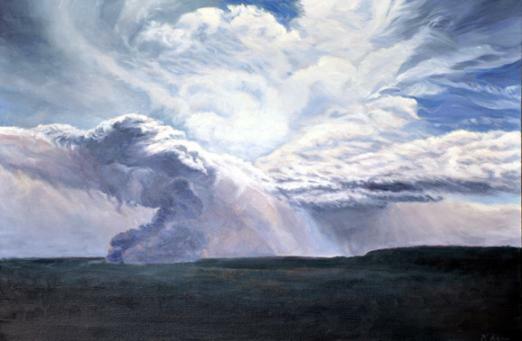 The painting above shows the Kilauea fumerole as the wind shifts direction scattering the ash and steam emanations. I love the shapes and patterns that the wind makes. I've heard that the lava is flowing again and I hope to get a chance to go see sometime in the next few months. In the meantime I've been keeping up to date through the USGS Hawaiian Volcano Observatory page. Here at home our amazing weather has shifted from a pattern of late season marine layers and cooler than normal temperatures to warmer, yet still nice, conditions. Maybe now the summer vegetables will make some more progress! In the meantime, I've been enjoying grapes, beans, greens, and an artichoke. Here is a painting's progression from drawing to almost complete. I took advantage of under-painting as a time to simplify shapes. With each additional layer I've refined the color, making the grays with blue/green over painting. It can be difficult to see from this small image, but there is still a lot of under-painting showing through at this stage. Almost done - I'll still be going in to add the smallest details. In a switch on their typical role as a retailer, Bloomingdale's has been buying artwork for display in their new store opening in Santa Monica at the end of the week. The selection of work for this new collection was made using a "blind jury" process. 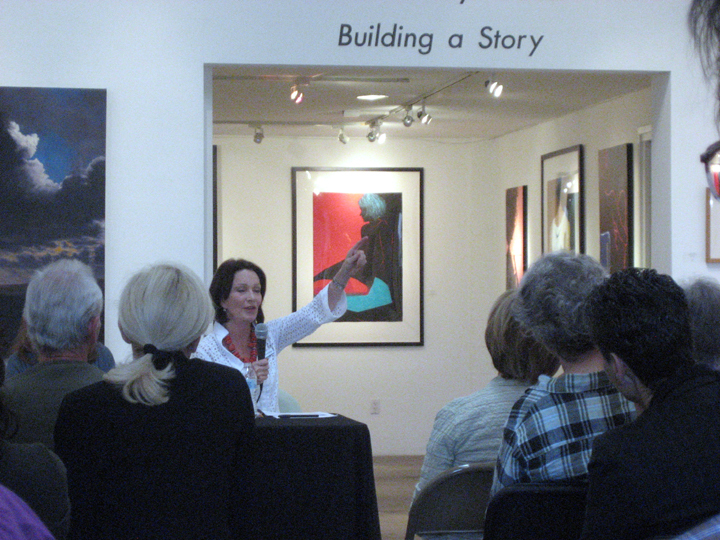 Bloomindale's went to Crussell Fine Arts and an open call to artists was announced. Over 300 artists responded with over 1000 images, out of which a final 17 pieces were chosen - the identities of the artists were not revealed until the very end of the process. I'm happy to say that the painting above, First Day, is one of the pieces selected. 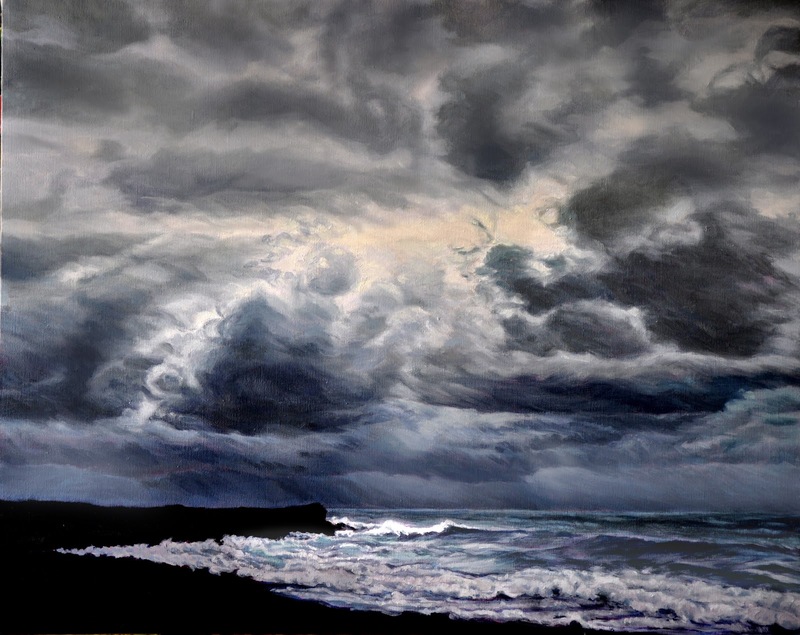 I remember how helpful reader comments and feedback were while I was working on this painting - your encouragement makes all the difference - thanks! 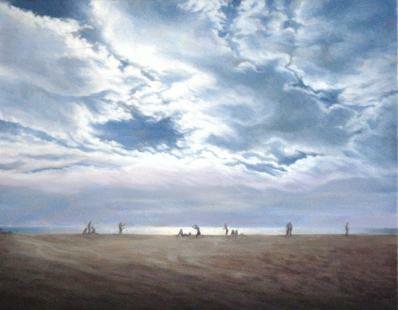 I'm developing this painting from a photo I took looking out the car window as I was driving home. The image wasn't shot during this past rainy season, but from a few years ago and has been sitting in my image file all the while waiting for it's time. I am fascinated with the way the drops from a fine drizzle sparkle on the windshield and the effect I feel it brings to an otherwise ordinary view. I've painted as much as possible of the background before adding the drops, pretty much everything except the foreground drops which I've just started defining, starting with the larger ones. At first I found the definition of the drops a little startling, having as they do so much more focus then the rest of the scene, but I've adjusted to how it looks and having decided it is correct I'll go on to complete this treatment for the many, many remaining drops on the windshield. What's holding me back? I need to get some more tiny brushes. The ones I have are all worn out. Hopefully this week I'll get a chance to get to the art supply store. I learned about this exhibition from the Volcanism blog, it's called Volcano: Turner to Warhol featuring five centuries of volcano art, obviously including Turner and Warhol, among others, as well as a selection of work from Icelandic artists. If I were in the UK I'd definitely go see it. A review of the exhibition from the Gaurdian. I just found and started following the Volcanism Blog last week and it has quickly become my place to go to for all things volcano. I count celebrating the Fourth of July as my final signal that summer is indeed here. 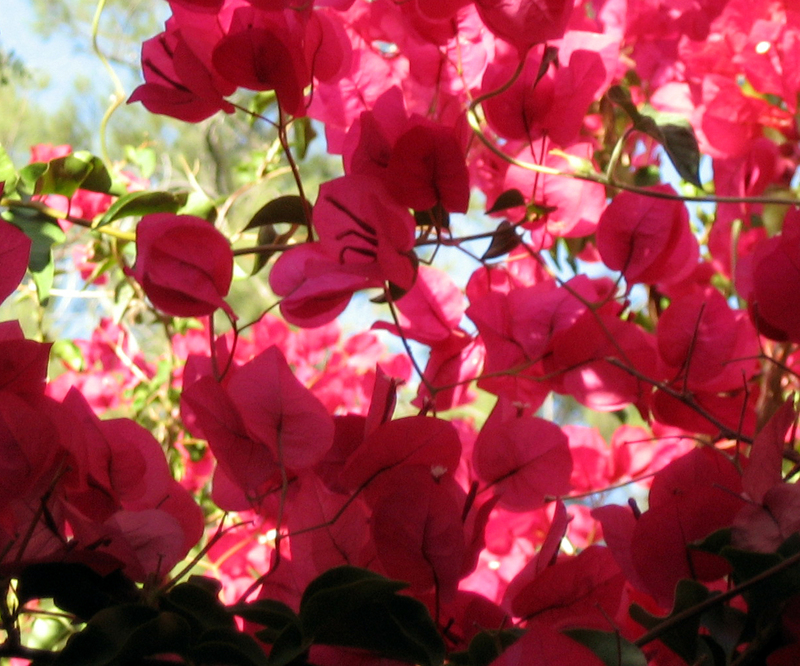 I had made goals to have certain things complete for summer, so that I could relax and enjoy it and this included finishing essential repairs and upgrades on my house. This weekend was hectic. The painters seemed as intent as I to finish and did so late on Saturday. In fact they were still working on the details when I left for the evening. Finish they did and I spent much of Sunday moving things around to be ready in time to watch fireworks from the deck, although we did end up walking down the block for a better view - the trees are just too high these days to see over, which is fine with me! By later that night, early on the fifth actually, it became apparent that everything had been just too much for Bear. Perhaps a combination of feeling like he was responsible for guarding the house from the painters all week, together with the fireworks - a big display and all the accompanying booming happening within 6 blocks of the house, all made him over anxious. When he wouldn't settle down, continuing to cry and bark periodically long after the fireworks were over, a late night trip to the emergency vet was necessary. There they checked him over and then gave him a sedative which calmed him down for the next twelve hours. He got the rest he needed - and so did I, and now he's back to his normal, sunny self. I've been semi imprisoned in my house this week, sealed in by plastic tarping and masking tape. The painters are here and the outside appearance of my house is changing as I write. Here are a couple of pictures that give you a glimpse of the changes so far. The grapevines have filled in a lot since taking the before picture about two months ago so some of the painting of the railings may have to wait until fall. The painters have been doing a great job of painting around trees and flowers, going so far as to wrap up one of the floxglove flowers next to the house to keep it from being splattered. I did manage to find my way out on Saturday evening and went to the opening at TAG, featuring Carol Kleinman, Darlyn Susan Yee, and Betty Sheinbaum. It was an unexpectedly eventful evening as the power went out - not just for the gallery, but for the whole neighboring area of Santa Monica. It didn't stop people from coming and and looking at the artwork. A recent, small drawing of mine, Coastal Pines, was sold too, I'm happy to say, and to lovely people - what could be better? 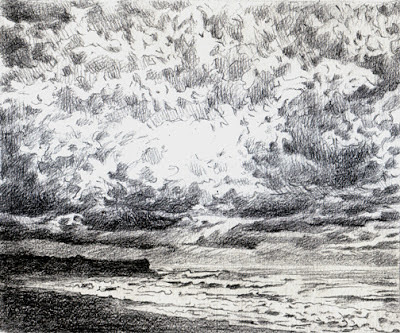 Above is a new underpainting of another stormy beach you can see the drawing for this painting here. This one's from Hawaii; the Big Island, and you can see the lava shelf formation that justs into the ocean on the left. I wonder if it's due to crashing on the hardened lava that makes the waves particularly loud, or if it's because the lava formations - which can be up to 50 feet in depth, trap and echo the sound. Whatever causes it, the effect is dramatic and thrilling. I've just sent out my summer newsletter this week. If you'd like to stay up to date by receiving the newsletter by email click here to subscribe .